The monograph in eight chapters systematically makes possible a view of the harmonies and discords between folk and »literary« creativity, and its contents link theoretical modelling of the relations between folk and »literary« poetics with historical-interpretive representations of these relations from the Enlightenment till contemporary Slovenian poetry. Within the latter literary period the analysis is limited to the years between 1958 and 2000 with extensive network of different creators seek out influences in folk songs. The special chapters are devoted to the analysis of popularised songs, inter-textual chains, Slovenian folk song in the poetry of Svetlana Makarovič, Veno Taufer and Gregor Strniša. The last chapter The Role of Folk Songs in Jože Snoj’s Novel Fuga v križu turns from poetry to prose. 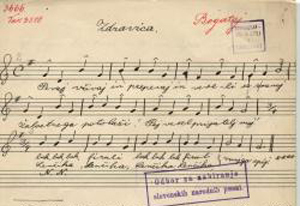 By juxtaposing and connecting two such different and creative currents, the book presents – primarily for experts, but also for the broader public – the exceptional significance that Slovenian folk songs had in the past and the phenomenon of which is recovered by postmodernist means in contemporary Slovenian poetry. The literarization of the folk song is perhaps one of the new ways the folk song lives today, despite the fact that it continues to live on in its original form as well.